The lst of May has proven to be a good time for hugh limits or for throwing back a lot of fish. 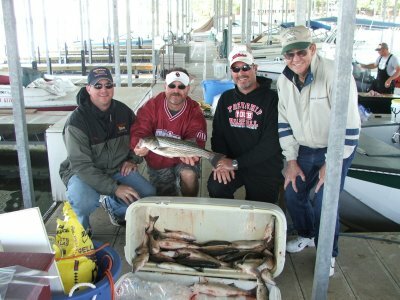 Although the limits were still somewhat small Saturday, there was plenty of action and fun for the White famlily. Sunday was the Lords Day, but Monday was mine again on the lake, catching some good fish, bigger than most fish caught so far. The biggest of course were lost on broken lines, as we could not turn them and they broke the lines. We did get our limit of over 20s, and great box fish. The rains run us off, but not before our limits. 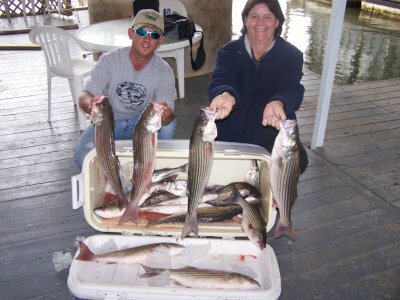 For more pictures of this weeks fishing check out Cross Creek Striper Guide's pictures page.